This excerpt is one I'm sure everyone will enjoy, even Abu Fans! This shows many shocking discoveries regarding Garcia, Mitchell reels and Abu and especially history lessons for us all. Anyone notice anything worth mentioning? Last edited by anonymous on Sun Jun 14, 2009 5:02 pm, edited 1 time in total. Very good,-I enjoyed that very much. Thanks very much for the posting Wallace. This and the other on Conolon is from the same film "The Garcia Story" as you may know. With that in mind, what do you think the date may be on these? OK I'll bite. Is that a prototype bail on that 400... noting the bail hold open notch? Should the 400 AR lever have the early hole? Well done Wallace! Sweet job. That Conolon piece is great, but the ABU/mitchell one takes the cake. That prototype is awesome. What was the commercial reel called that was based on it? First off I have to say every time I watch this film I discover something I didn't know. In looking at the high resolution DV, the bail wire appears to be the one most common with the notch but it appears to be slightly different by micrometers. The bumper head also appears to be slightly larger. Good catch on the Anti-Reverse Lever, I didn't see that. It is one not even similar to the 350 or any other 400 model I've seen. Could this be another Pilot reel? Thanks mate, these are most exciting to me and just couldn't wait any longer to show others! I had told Wayne, our friend from Oz, about the pink Ambassadeur and he didn't believe me. We thought this may be a color problem in the film but trust me, it's pink. "Known as the 1000 series, the first three issues - 1040 (4/0), 1060 (6/0) and the 1090 (9/0) were offered in a wood display case. These were sold in both European markets and by Garcia starting in the late sixties. In 1977 Mitchell introduced the 1120 (12/0) that was only distributed in Europe. The 1000 series of big game reels were not made to compete with Penn as some believe, but to compete with the Californian brand also made of anodized aluminum side plates. It is the Mitchell 600 series that was originally designed to compete with Penn. 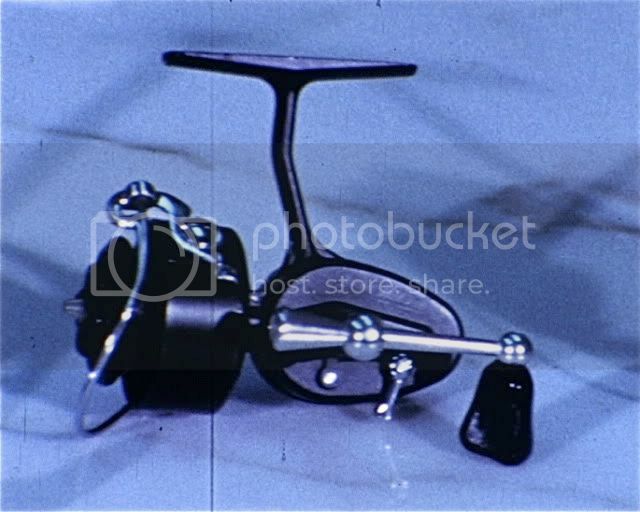 It was later on when Penn came out with their own series to compete against all metal reels! (Updated October 5th, 2008 by JP Gumprich)"
A very interesting film, thank you for airing it. I have watched it several times. If the two films clips were made the same time they are therefore made before the death of Johnny Dieckman which I believe was on the March 1st 1962. I must also say the "600 series" of reels on display were a surprise, I am led to think were introduced in the mid nineteen-sixties, therefore Mitchell must have a lead-in time of at least three years. I am going to watch it again!! That is why I always say advertising does not mean much, if anything it shows what vendors believe will sell and at what time. This varies greatly between countries as well. This film is date coded, meaning when the film was made, and in this case 1961. I am saying early 1962 just to be "safe" I guess but in fact I think these were made in 1961. Why? The main reason is the "auto-spin" reel, listen to what is said. He never mentions Abu but in fact that reel was a Garcia Abu 505 Auto-Spin first advertised in the 1962 Garcia Tackle Catalog printed in 1961. There's a lot to be learned from these films, I wish I could show them in their entirety!!! Your comment on the 308 engraving intrigued me because when I study a high resolution scan of this early ad from the 1960 Trade Catalog, you can see the picture has been edited to black out the silver pins on the handle side. I can also see disturbed pixels around the "Mitchell 308", making me think an editor may have placed it there. Also noted the shifted position of same. Perhaps pilot reels were not engraved as you suggested? On a different subject, how about the 1962 408? Lastly, Wallace thanks for the cool stuff here...we all really appreciate it! The Mitchell 308 was being sold in 1958 and this film is long after that my friend. The glare on the one shown must be blocking out the engraving. I'll open the raw footage, capture an image and post what I find here tomorrow. Too late for me to do right now plus I just broke off a tooth!!! Ouch! Superb footage again wallace, have you noticed the name mitchell in the reflection of the what seems to be glass that the reels are stood on? it looks upside down and back to front but definately sais mitchell. The 308 on my screen seems to faintly show "garcia mitchell 308" engraving but obviously not in white, then again it could be my eyes. Hello Mates, Yes it is engraved as you can see in this captured image. This is what "raw" footage looks like!!! I had to sharpen this jpeg image to enhance the engraving. Sharpen in one option I don't have on any movie editing program, don't know why. Throughout this film there are blurry sections, this is one of them. Even sharpened it is still blurred, I can only do so much. This also helps show why doing these (properly) takes so long. Yes i'm convinced now ,good job !! I could not see it on my screen.. Rob, the 3-0-8 ad that you posted intrigued me because the place of the the 3-0-8 engraving is not common. Normally the engraving is a straight line or 3-0-8 a bit down . I don't know why they covered the silver pins ..
Tom Lenk announces the plans to Move to Teaneck, NJ on September 11, 1961 located between Tietjen and Alfred Avenues. 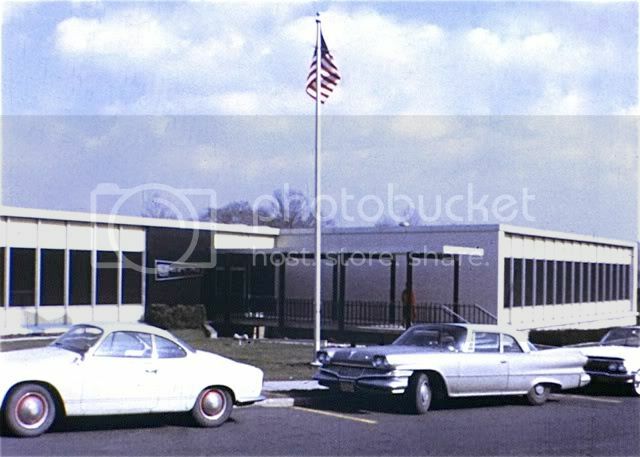 Plans call for a single story "modern" 32,500 square foot building for their corporate offices and "warehouse" to include all "Garcia" operations to be completed by early next spring (1962). The property borders a residential neighborhood called Rosemont Place in the town of Englewood who unsuccessfully fought against the "factory" being build. Sitting vacant and for sale! Any takers? Nice Mitchell Museum Site!!! In talking with Wayne of the Abu website, Real's Reels, he confirms with no doubt the Abu 505 Auto-Spin was introduced in 1961. This and the sad death of Johnny Dieckman as Jim stated pretty much confirms the date this film was made is indeed, early 1962. Last edited by anonymous on Thu Jun 18, 2009 5:03 pm, edited 1 time in total. New York Times, Dec. 9, 1961 - Garcia is building executive offices and warehouses in Teaneck. New York Times April 4, 1962 - Garcia is advertising for a bookeeper and states it will relocate to Teaneck within 3 months. I'm confused on the one article dated April, 1962 so I discussed this with Doug DeSimone, keeper of records for the "Garcia" family. He has given me copies of all newspaper articles which tells the same story as we've been discussing. He also says they moved to Teaneck in early 1962. I have several records about employees being offered their same positions in Teaneck if they wanted to move or commute. I don't have the 4/4/62 NYT article where Garcia is advertising in New York for a bookkeeper in Teaneck to relocate within 3 months. Was this for the position maybe? Can you post this article? On another note, I'm surprised nobody has questioned the "odd" address shown on the Trade Catalog you posted above. The Classified Ad I cited dated April 4, 1962, was also ran April 3, 1962. My research material comes to me copyrighted so I'm not willing to post it in its entirety. At the risk of getting sued, I will quote the classified ad "BOOKEEPER Expd all phases including payroll. 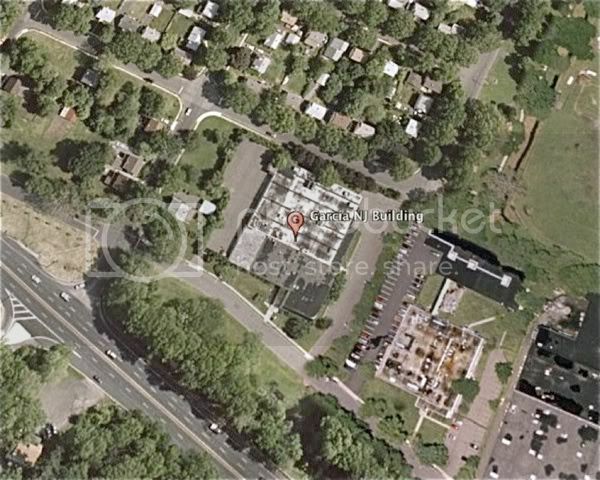 Will relocate in Teaneck NJ within 3 months in beautiful new air-cond office. Salary open. The Garcia Corp. 276 Park Ave. South." Additionally, the Dec 9, 1961 article that discusses the new building reads "Englewood. N.J., Dec. 8 - Suit will be filed Monday in Federal District Court, Newark by a group of Negroes here to prevent the construction of a warehouse and executive offices just off Route 4 in Teaneck for the Garcia Corporation, a fishing tackle concern of New York"
From what I can gather, the land was originally bought by Teaneck with implications it was to be for a bird sanctuary. I found that article, the original newspaper clipping from Doug DeSimone, keeper of records for the "Garcia" family. Look for another one dated December 12, 1961 where it's reported that they were now trying to "halt construction" of this factory. At first we were being told Garcia moved to Teaneck in 1969 which was not true. When I did the first article a few years ago proving they moved there in 1962 , I've been defending this correction to date. What's funny about this discussion is now we're debating what month in 1962 did this happen? Truth is I'm just happy to have finally proven it happened in 1962. The move timing is important to me because, in my mind, it is a significant event that impacts my paperwork study...and helps me with the puzzle. I will be happy to share anything with you as always. I didn't mean to imply it's not important. Right now from what you have said, you believe they moved there about July, 1962. In my opinion what's important to your study would be when did they "start" moving in or most important, when was this film made. In talking to Wayne Real who discussed this film with Len Borgstrom, AB Arfabriken (ABU) who was there, I've been told the "new" (ABU) reel shown in the film was first made in 1961. He is so sure, he thought this film was made in 1961 but knowing that's wrong admitted it could have been in very early 1962. I was in construction for over 15 years as a landscape and irrigation designer and watched many buildings pop up. We were called in after the building was dried in but not finished on the inside. When we finished the building appeared to be there for a long time if we used sod and not seed for the lawns and 5 to 10 gallon plants. From my experience I can see signs of new sod on the lawn but most important, look at the trees in the background without any leaves. Find out when leaves are first in full bloom in Teaneck, NJ and we can narrow down the date. Hope this helps. PS: I've been told that these trees are Oak, probably Red Oak, that are in full leaf by May of each year. Those who care should also know that in this film there are no other shots of the building inside or out other than what you see. This again makes me believe this film was made even prior to completion, maybe staged? The other films on Kingfisher and Conolon show many areas of the building as you can see. Sorry I didn't call you back the other day. I wanted to get registered for the Group and see what the forum was about. Beside, I fell asleep on the couch. It's nice to have a friendly atmosphere in which to discuss our common interest. Thanks! Last edited by rng1966 on Tue Jul 21, 2009 6:26 pm, edited 1 time in total. You my friend will be a great help. I know how you like to study and like me, try to learn.